Social Security Disability Lawyers - Think You Have a Case? Need a Social Security Disability Lawyer? Want Help Applying? Claim Denied? Do you have a severe physical disability or mental health disorder that keeps you from working full-time? Has it lasted, or is it expected to last, for at least one year? Do you have a life-threatening disability? Were your benefits terminated? If you answered "yes" to any of these questions, you may be eligible for Social Security disability benefits. But did you know the government denies the majority of claims, even when people deserve them? If you applied for SSD benefits at a local Pennsylvania Social Security office and the Social Security Administration denied your claim, don't give up. But you need to act fast – you only have 60 days to appeal. Our Pennsylvania attorneys at Edgar Snyder & Associates can help. What is Social Security Disability? Do I Need an Attorney? Social Security disability (SSD) is a part of the Federal Social Security Act. It provides disability payments and other benefits for those who are disabled and can't work. Benefits are often referred to as Social Security Disability Insurance (SSDI) benefits and can include cash payments and medical coverage. You may be eligible for benefits or Supplemental Security Income (SSI) if you've been permanently disabled in an accident or if you're suffering due to a disabling physical or mental condition. Benefits depend on your work history, financial situation, and medical needs. It's important to act quickly, because there are time limits to file a claim. The best thing you can do is contact our Pennsylvania attorneys for a free legal consultation of your denied claim. If you haven't applied but have questions about the process, we can help you apply. There are no strings attached, and you're not obligated to use our services, so get a free legal consultation today. 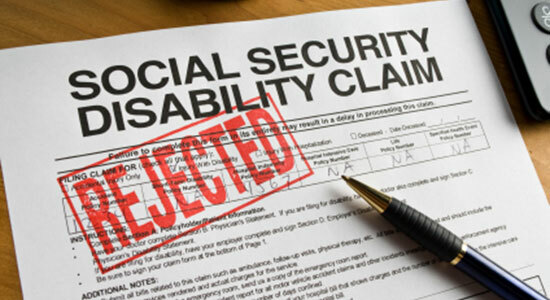 Denied Social Security Disability Claim? Many people who apply for Social Security disability benefits find that their applications were denied -- even those who qualify. If this has happened to you, we know you must be frustrated. You can't work and need to be able to pay your bills. On top of that, the appeal process is very complicated. That's why our Pennsylvania attorneys have helped thousands of people with disabilities appeal and get the benefits they desperately need. We win the majority of the claims we appeal for our clients. From the moment you hire our law firm, we go to work for you. Our Pennsylvania attorneys and legal staff will keep you up-to-date with the progress of your case. We cut through the red tape and get you the money you deserve, and we answer any Social Security disability questions you have along the way. Remember, you have only 60 days to appeal if your claim was denied. Otherwise, you have to start the process all over again. Don't waste another minute. Get started today with a no obligation, free legal consultation. Call us 24/7 at 1-866-943-3427 or submit a form online and let our Pennsylvania lawyers help you with your denied SSD claim. Remember, the clock is ticking. Contact us now. To learn more about Social Security disability benefits, check out our Social Security disability articles and resources.